This season’s crop of state-bred 2-year-old pacing fillies will begin their march towards the Night of Champions with the first $12,500 legs of the Incredible Tillie series. Those two stake events will go as the fourth and sixth races. The older ICF pacers, and in some cases not that much older, will compete in a pair of $15,000 Opens restricted to only Illinois breds. “The boys” will tangle in Saturday’s opener while “the gals” are in the middle (race five) of the 10 race program. The Saturday race card also got spruced-up with an Open II for fillies and mares (race eight) with the expected favorites Kyles Secret (Travis Seekman) Pretty Image (Tim Curtin) and Velocity Layla (Kyle Husted) landing the three outside posts (6, 7 and 8), in that order. The first Incredible Tillie event is headed up by the Herman Wheeler Stable’s Yankee Joanie (Ryan Anderson) who is 2-for-2 to start her racing career. Two weeks ago the Yankee Skyscraper filly captured her $29,925 Violet in impressive fashion with a 1:57 flat clocking from the outside post in a six-horse field. Tonight she gets away from the advantageous pole position. Looking to put a first blemish on Yankee Joanie’s past performance lines are Thanksfortheprayer (Travis Seekman), Flipfloppinflossie (Tim Curtin), Summer Sage (Issac Love), Fox Valley Hotcake (Juan Franco), Grace Ann (Gary Rath) and Cardinal Fancy (Ronnie Gillespie). The trio of Winter Gram (pp 3, Ridge Warren), Foolishlittlegirl (pp 5, Kyle Wilfong) and Fox Valley Halsey (pp 6, Casey Leonard), will likely get the bulk of betting public’s money in the second Incredible Tillie split. The Tom Graham Jr’s Winter Gram has won her last two races, including a division of the Violet, in up-close fashion and will likely go out and be there again. 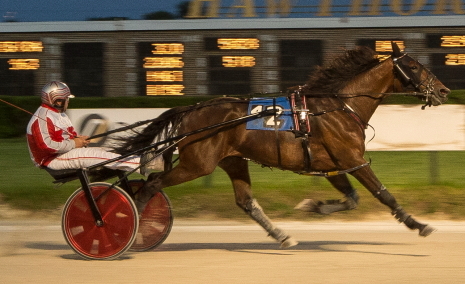 Foolishlittlegirl paced a 27.1 last quarter when she was second best in her Violet division. The youngster will race out of the Jim Eaton stable for the first time tonight. Fox Valley Halsey, from the barn of Nelson Willis, has been sent off at even-money and at 4-5 when she finished second in her Violet and third a week ago with a less-than-desirable trip. They’ll be tested by Fox Valley Lil Kim (Tim Curtin), Sissy Dune (Ronnie Gillespie), Genie The Mooss (Gary Rath), first-time starter Fox Valley Torrid (Tim Curtin) and Ruby Ruby Ruby (Kyle Husted). Saturday’s first race, the $15,000 ICF Open for male pacers, brought out (in post position order): Bowedfortova (Robert Smolin), He Gone Jack (Tim Curtin), Cole Heat (Tyler Shehan), Fox Valley Reggie (Kyle Wilfong), Backstreet Lawyer (Kyle Husted), the 3-2 programmed favorite Fox Valley Nemitz (Casey Leonard) and Fourboltmane (Ryan Anderson). Backstreet Lawyer, a Tom Simmons’ trained stablemate of Fox Valley Nemitz, motored to 1:50.4 mile in the first of his two Carey series victories and leaves the 3-year-old ranks for the first time. The Kim Roth trained 5-year-old mare Phyllis Jean (pp 4, Matt Krueger) will open as the 5-2 first flash favorite in the ICF distaff Open when she takes on Char N Marg (Casey Leonard), Lady’s Party (Tim Curtin), Bucklegirl Bobette (Ryan Anderson), Lexington Lady (Robert Smolin), Boogie On Down (Kyle Wilfong) and State Street Liz (Ridge Warren). Stepping Up: Meyer On Fire (Kyle Husted) and Frontier Muffler (Freddie Patton Jr) took a major step towards the $100,000 Incredible Finale Final on the Night of Champions with victories in last night’s first legs of the stake series for ICF pacing colts and geldings. Both division winners were sired by Sagebrush. In the first Incredible Finale division, the 6-5 co-favorite Meyer On Fire ($4.40) made a move on the backside to get command, gave it up to Viola, and then came back in mid-stretch to retake the lead and pull away to a three and one-half length victory in 1:57.3. Viola (Ryan Anderson) held on for second while the other co-favorite The Bucket (Casey Leonard) had a wide mile and was a non-threatening third. Driver-trainer Freddie Patton Jr., made what turned out to be the winning move with Frontier Muffler ($6.60) soon after the first quarter, clearing to front and going on to take the second Incredible Finale field to the half in a modest time of 1:01.2. When the stretch drive came Frontier Muffler had enough left to hold off Ryan Racketeer by a half-length while Cooter Luke (Tim Curtin) who lacked racing room in the lane, was right there to be third in the 1:59.3 mile. The 7-5 favorite Maximus made a break on the backstretch and eliminated himself. 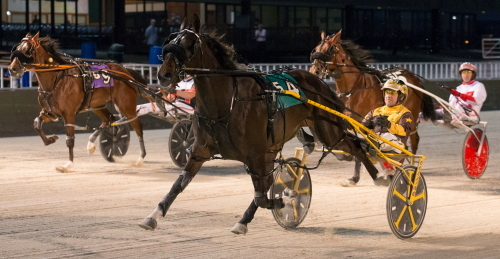 Illinois conceived and foaled 2-year-olds will take over the public’s attention this week at the Hawthorne summer meet beginning with Thursday night. The first leg of the Fox Valley Flan stake series for juvenile trotting fillies enticed 13 entries and was split into two $12,500 divisions. The initial leg of the Kadabra for trotting colts and geldings attracted the same. They’ll go as the first four races on Thursday’s program. It’s very early in the 2-year-old. There will be three more Fox Valley Flan and Kadabra legs contested, before the top 10 point earners are established for the estimated $100,000 finals on the September 22nd Night of Champions. Nevertheless, the recent Violet and Cardinal results indicate that division winners Heidi High and Encantado in the filly section and Fox Valley Picaso, along with recent winner Hawthorne Prince Cassis, are among the colt and gelding Night of Champions nominees already appearing to be major contenders on the march towards Hawthorne’s showcase evening of the meet. Heidi High has breezed in her first two starts for her owner, trainer and driver Charles Arthur and landing the pole position in the first Fox Valley Flan split should see her go right to the front again. She’s been in 1:59.1 twice and won her Violet division by almost five lengths. Looking to overtake the New Balance filly will be: Skippymalou (Juan Franco), Lous Mistress (Tim Curtin), Puddin Cheeks (Jared Finn), Pizza Maker (Casey Leonard), E L Game On (Kyle Wilfong) and Lous Scion Lou (Ronnie Gillespie). The Jim Eaton stable’s Encantado (Kyle Husted), certainly came out ready for her debut when she was the best in her Violet split. The filly left from the 8-slot in a 9-horse field in her June 17 debut. Tonight she moves inside to the three. Friday I’m In Love (Casey Leonard), from the always strong trotting division of the Mike Brink stable, was second to Encantado in their first match-up, beaten less than one length. 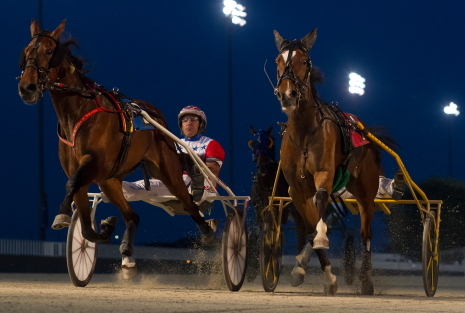 The filly should get plenty of play tonight with the meet’s leading driver back at her lines. The other second Fox Valley Flan split hopefuls are: Joe Joe’s Violet (Juan Franco), Loussolataire (Kyle Wilfong), Christie K (Tim Curtin), Louzotic (Steve Searle) and Notanangel (Travis Seekman). Cardinal champion Fox Valley Picaso (Casey Leonard), was hammered down to 1 to 5 in his 2:01.2 winning debut after an impressive 2:00.1 in Hawthorne qualifier two weeks earlier. With the one-post again, in the first Kadabra division, the Herman Wheeler freshman will probably go off as a prohibitive favorite, when he takes on five first season foes in the Thursday opener. Rusty Red Valor (Tim Curtin), Frontier Manard (Freddie Patton Jr.), Captainblacksparrow (Kyle Wilfong), first-time starter Crackerjack Bill (Jared Finn) and Lous Endeavor (Ronnie Gillespie) are Fox Valley Picaso’s opponents. The third race second Kadabra division will see the Brink’s stable’s Prince Cassis (Casey Leonard), at 4-5 first flash odds after his sharp winning debut four nights ago, coming home in 28.1. The Cardinal third place finisher Foxvalleyrushhour (pp3, Kyle Husted), is listed at 4-, followed at 9-2 by the first time starter Trixie’s Turbo (Jared Finn), and trained by Heather Stell. Trixie’s Turbo is out of the broodmare Tropical Trixie, making him the younger brother of past ICF multi-stake champion Captain Greedy (1:55.4), and current the Hawthorne trotter Trixie’s Jethro. The third race Kadabra division is rounded out with: Swaneelou (Wyatt Avenatti), Lourhianon (Kennedy Linsey) and Fox Valley Cruise (Kyle Wilfong). The opening legs of the Incredible Finale stakes series for state-bred colt and gelding pacers will be raced Friday night, while the ICF juvenile pacing fillies will tangle Saturday evening in the first rounds of the Incredible Tillie series. To get a shot at the winner’s share of the $85,000 (est.) Robert S. Carey Final on the Night of Champions an ICF 3-year-old colt or gelding pacer has to earn it. The ten top point earners in the stake series four legs go for the big pot. The next top ten point finishers will compete on that September 24th night for a sizeable lesser purse of $15,000 in the stakes consolation. 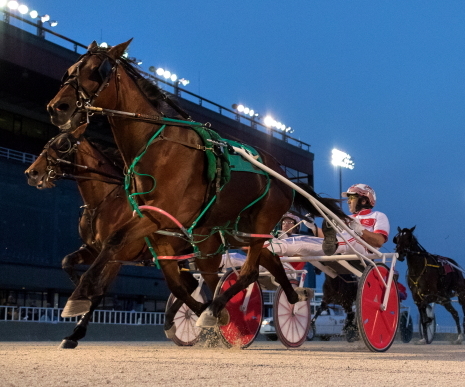 Fifty points is awarded to a horse winning a Night of Champions stake series event. Then it’s 25 for second, 12 for third, 8 for fourth, 5 for fifth and 1 for starting. Therefore it wasn’t that surprising to see leg two of the Carey series end up with three divisions. However, what was a bit of a revelation was the number of 28 entries, ensuring that the three $12,500 Carey divisions will have a pair of 9 horse fields and a 10-horse field. Unbeaten.in 14 career starts and the 2016 Illinois Horse of the Year Fox Valley Gemini (pp 3, Casey Leonard) landed in the sixth race third Carey division and again looks like a stick-out. Having the bad luck of drawing into that division are Ernie The Mooss (Gary Rath), Talk About It (Ridge Warren), Song Cycle Senese (Kelcey Perymond), Beach Shooting Star (Mike Oosting), Herecomesmagotta (Tim Curtin), Sheriff Coffey (Ryan Anderson), Dandy Dune (Ridge Warren) and Sagebrush Shocker (Kyle Wilfong). The fourth race first Carey division looks to be very competitive with really no-clear cut favorite. The Hawthorne program lists You’remyhearthrob (Kyle Wilfong) at 9-5, probably based on the pacer’s consistency. The home-bred has been third or better in all seven season starts. However, Al’s Briefs (Travis Seekman) should get a lot of play as well, despite drawing the 10-hole. After his third place finish in the first Carey leg the Clark Fairley trainee has rattled off three consecutive wins, capturing a Cardinal division on June 1st, coming from 10th and last to win a conditioned event nine days later, and then four nights ago breezing in a division of the Downstate Classic affair at Carrollton. It’ll be interesting to see what the betting public does with the Hoosier Park invader M T Gunslinger (pp 1, Casey Leonard). You might remember him from last summer. The horse won in 1:55.1 in his freshman debut for trainer Charles Arthur and was sold two weeks later to Little Bapa LLC of Sacramento, California. M T Gunslinger ended his freshman season racing at Lexington. M T Gunslinger is winless in his first seven starts this year with the first two coming at Pompano Park for conditioner Dwayne Minor and the last 5 in Indiana for trainer Rick Plano. Also going postward in the first Carey group is Frontier Frank (Mike Oosting), Hart To Heart (Tim Curtin), Sports Creek (Ryan Anderson), Bootleg Island (Kyle Husted), Not Me Gram (Ridge Warren) and Heza Shooter (Tyler Shehan). The Tom Simmons Stable’s Backstreet Lawyer (pp 4, Mike Oosting) is the 9-5 morning line favorite in the second Carey division and he deserves it. The Sagebrush gelding paced a quick 1:50.4 winning mile in his initial Carey leg and was a strong second in his Cardinal split. Nevertheless upsets happen every racing night and there’s a number of 3-year-olds that could pull off a surprise victory among the other 9 starters: Special Sauce (Ryan Anderson), Fox Valley Sinful (Kyle Wilfong), Cool Casper (Tim Curtin), Yougotitfiguredout (Ridge Warren), Shark Flipper (Tyler Shehan), Shooting Straight (Casey Leonard), Fox Valley Jalan (Gary Rath), Fox Valley Hijinx (Kyle Husted) and Molina (Robert Smolin). Crowded Dygert Field: Round two of the Erwin F. Dygert trotting stake series is the eighth race Sunday and it’s a jam packed field off 11 colts or geldings tangling. The early favoritism is divided between Majestic Caprice (programmed 3-1, Tyler Shehan) True Detective (7-2, Curt Grummel) and Vic’s Pizza (4-1, Mike Oosting). True Detective was a romping winner in a division of the Cardinal trot earlier this month after being upset by his Curt Grummel stable-mate Big Lou (pp 10, Tim Curtin) in the first leg of the Dygert. Majistic Caprice has really come on well as a 3-year-old for trainer Roshun Trigg with four victories in his last six starts. The Malabar Aqua trotter has 11 wins in his first 30 trips career trips to the gate. Vic’s Pizza, the 2-year-old division champ for trainer Mike Brink, was second to True Detective in the Cardinal however it was his first race in nine months after sustaining a leg injury last September. 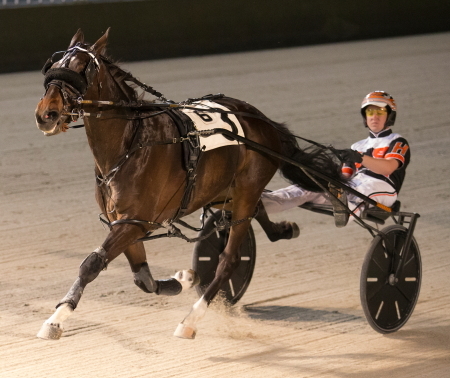 Brink also has last season’s Night of Champions victor Illinimight (pp 8) in tonight’s Dygert with Casey Leonard at his lines for the first time. The other Dygert hopefuls are Fly The W (Ridge Warren), Freddie Da Fox (Cornelius Cavett ), Cruzen Cassi (Jared Finn), Two News (Travis Seekman), Fox Valley Strpwr (Freddie Patton Jr.) and Don’t Be Cheekie (Ronnie Gillespie) in the second tier with post 11. Repeats in Beulah Dygert: Good Design (Kyle Wilfong) and Maui Mama (Casey Leonard) were convincing winners in their respective second leg divisions of the Beulah Dygert stake series for state-bred 3-year-old trotting fillies. Good Design ($5.00) went right to the front, opened a six length lead at the first quarter pole, and cruised to a 1:55.4 clocking for trainer Brett Wilfong, three and one-half lengths ahead of runner-up Trotting Grace (Kyle Husted). New Queen (Casey Leonard) was third. Good Design also won her first leg of the series on the front-end. The Mike Brink Stable’s Maui Mama ($3.00) proved fastest in the lane as she came on in the late going for her second consecutive Beulah Dygert series win. Sunny Sasha (Jared Finn) came on in the late going to nip White Pants Fever (Steve Searle) for second, both beaten almost two lengths in the 1:57.3 mile. The second round of the Plum Peachy series provided an upset in both $12,500 divisions when The Sister Master (Michele Morgan) popped at $17.60 and Skeeter Machine (Kyle Wilfong) eked out her win at $28.20. The Sis Master, trained by her driver Michele Morgan, was parked-out the first quarter of the mile getting command from the outside nine-post and went on to a one and one-half length triumph in 1:53.4 over the 3-5 favorite Fox Valley Jazzy (Ridge Warren) who was given a two-hole trip. Skeeter Machine was tipped-out of third in the last turn by Wilfong and the Alan Bowen trained filly steadily made up ground in the lane. A surge in deep stretch saw her nip the 2-1 second choice Rollin Coal in the final strides of the 1:54.1 mile. In all types of competition fans want to be treated to a good “match-up.” Saturday night at Hawthorne we have a topnotch match-up in all four divisions of the second legs of the Night of Champions stake series. In the second race first Beulah Dygert 3-year-old filly trot first leg winner Good Design (pp 3.Kyle Wilfong) looks to get back in the winning grove against New Queen (pp 1, Casey Leonard) who defeated last season’s Illinois 2-Year-Old Filly Trotter of the Year when they meet earlier this month in a division of the Violet. Trotting Grace (pp 2, Kyle Husted), second in both the first Beulah Dygert leg and to New Queen in the Violet, is another major threat along with Downstate Classic champion Lous Silver Star (pp 4, Juan Franco). Shadow Copy (Gary Rath) and Fox Valley Unleash (Robert Smolin) are the longshots of that race. The fourth race second Beulah Dygert split of the night will see first round winner Maui Mama (pp 4, Casey Leonard) and Violet champ White Pants Fever (pp 5, Steve Searle) renew their rivalry. They’ve traded wins in their first two sophomore stakes starts. They’ll be challenged by Maple Grove Ellen (Jamaica Patton), Frontier Jackie (Tim Curtin), Sunny Sasha (Jared Finn) and Powerful Temtrist (Tyler Shehan). In the first of two $12,500 Plum Peachy stake series events for ICF sophomore filly pacers, last year’s division champion Fox Valley Jazzy (pp 5, Ridge Warren) is fresh off a Violet split victory after a second place finish in her first leg of the Plum Peachy. The pride of the Dale Kanitz stable figures to get a strong challenge from The New Americana (pp 2, Casey Leonard) who was the runner-up in her stake series outing and was third to “Jazzy” in the Violet. The Steve Searle trained filly put almost $70,000 on her card as a freshman. They’ll be tested by Shesincrediblenasty (Jamaica Patton), Breathtaking Sky (Robert Smolin), Lotus Gram (Tyler Shehan), Shelby Rae (Gary Rath), Frontier Ginger (Richard S Finn), Shooting Cool (Tim Curtin) and The Sis Master (Michele Morgan). The second Plum Peachy event on the 12-race card has Allbeastnobeauty (pp 8, Tim Curtin) looking to make it four in a row and remain unbeaten as a 3-year-old. The Mike Brink trained filly beat Fox Valley Jazzy in their initial Plum Peachy leg with a career fastest 1:53.2 mile and then crushed her field in a division of the Violet by seven widening lengths. Hosea Williams Rollin Coal was a comfortable front-end winner in her first Plum Peach leg but went inside the pylons and was disqualified in her Violet division. Rollin Coal was scratched sick two weeks ago. If she’s near her best she can give Allbeastnobeauty all she can handle tonight. Looking to topple the above pair are Fox Valley Catwalk (Ridge Warren), Frontier Cuzin (Gary Rath), Fox V alley Miranda (Jamaica Patton), Skeeter Machine (Kyle Wilfong), Frontier Red (Juan Franco), Party Belle (Ryan Anderson) and JB’s Shooting Star (Tyler Shehan). We won’t have to wait long for the first anticipated match-up of the night. It’s come in the first race for 2-year-old pacing fillies when the one-two Violet finishers Tom Graham Stable’s Winter Gram (Ridge Warren) and Fox Valley Halsey (Casey Leonard), from the barn of Nelson Willis, tangle again. Anna’s Lucky Star (pp 8, Kyle Wilfong) and Picky Picky Valor (pp 5, Casey Leonard) have won all five of the Open trots raced thus far at the Hawthorne meet but that streak is in danger in the eleventh race $10,000 Open. The Jim Eaton Stable’s Walter White (pp 7, Kyle Husted) is in town after pulling down over $70,000 thus far this season competing in Ohio and Indiana. Walter White made one Hawthorne appearance at the winter meet and came away with an Open victory. 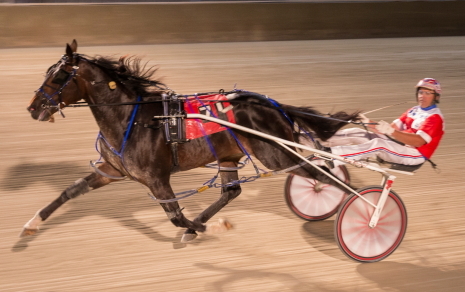 Last summer the now 6-year-old trotter started on the local scene twice, capturing one Open and was second in the other. The 2018 IHHA Board of Directors election will take place at the Annual Meeting on Saturday, August 18, 2018, at 12:00 noon at the IHHA office located at 15 Spinning Wheel Road, Suite 432, Hinsdale, Illinois. Ballots will be mailed to all IHHA members (in good standing as of June 30, 2018) on July 19, 2018 through the offices of Legacy Certified Public Accountants, which have been retained as the official Election Supervisor in conjunction with Article III of the IHHA By-Laws. The 5-year-old ICF pacer He Gone Jack will be cast in his familiar longshot role tonight, when he goes postward in the second and tougher of the two Open II Paces on Hawthorne’s card. The star of the Ray Hanna staked, pulled off an upset last week in an Open II event, when he was given a very favorable second-over trip by his veteran driver Tim Curtin, popping at $36.60. “That’s about as good a trip as you can get,” said Hanna. He Gone Jack is having a very solid Hawthorne meeting. All six of his summer starts have been in one type of an Open Pace or another and he’s missed only one check while winning twice and being nosed out of another back on May 11th. One week earlier, the Richess Hanover gelding, captured an Open III Pace for his owners and breeders Hugh and Susan Lacey of Joplin, Missouri. He Gone Jack is only $400 short of $20,000 on his season card and has been going off at some high odds. He was 17-1 last week. A week earlier at 14-1 and in his first June start, he was at 52-1, when he was came from ninth and last to end up three lengths behind the winner. He Gone Jack’s reward for winning last week at 17-1 odds was to draw for the two outside posts in this week’s fourth race Open II. He landed the six-slot, while the Terry Leonard Stable’s, Ponda’s Prospect, unbeaten in his three Hawthorne outings, gets his first outside post of the meet with the seven. The first group of posts, one through six, were drawn separately and went to: Why Ask Why (Kyle Wilfong), Royale Rose (Travis Seekman), Somesartsomewhere (Kyle Husted), Buff’s Image (Ryan Anderson) and Southwind Indy (Tyler Shehan). The classy Somestarsomewhere has spent the summer at Hoosier Park racing in either Invites or Open I or 2 events for trainer Tom Simmons. The 7-year-old pacer has a mark of 1:49.2, taken at Lexington as a 2-year-old. The winner of 25 lifetime races is closing in on $450,000 in career earnings. Another Open II Pace will go as the third race on the Friday program. From the pole position out, you’ll find Best Man Hanover (Travis Seekman), Terror Of The Nite (Kyle Husted), Southern Flight (Casey Leonard), Fresh Cut (Ridge Warren), Kelly D (Mike Rogers), Hash-Tag Swag (Kyle Wilfong) and Parklane Official (Juan Franco). 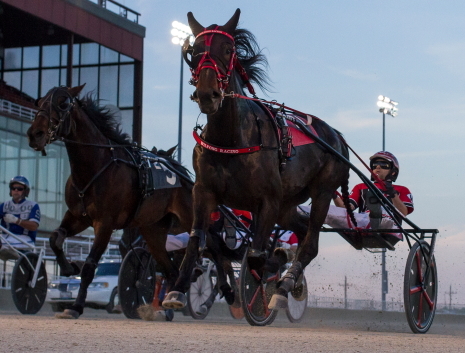 With the second legs of Hawthorne’s Night of Champions 3-year-old stake series on tap this weekend, a number of ICF sophomore pacers and trotters will be asked to perform double duty this week. 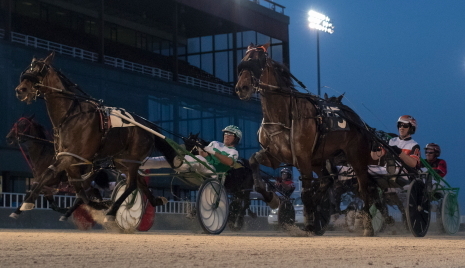 Round two of the Plum Peachy for state-bred filly and mare pacers and the Beulah Dygert for second season trotters, will be contested on Saturday night, while their 3-year-old ICF male counterparts will race on Sunday in the Robert Carey stake series for pacers and Erwin Dygert for trotters. 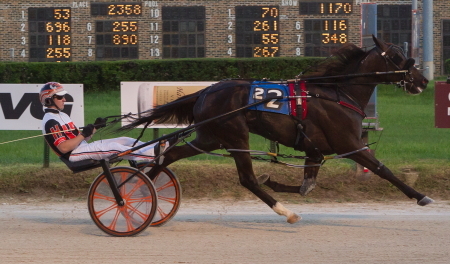 Numerous ICF pacers and trotters who competed Tuesday evening in the 3-year-old Downstate Classic stakes on the Green County Fair programmed at Carrollton, will be back with either 3 or 4 days off when they go to the gate in the second $12,500 legs two of Hawthorne’s Night of Champions series added money events. 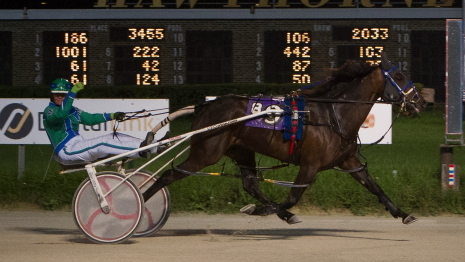 Just about all of Carrollton’s Downstate Classic 3-year-old champions will race again this weekend at Hawthorne. 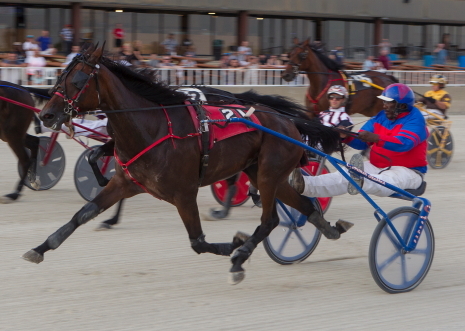 They include the 3-year-old filly trot winner, White Pants Fever (Steve Searle), in the first division and the one-two-three finishers Lous Silver Star (Ronnie Gillespie), Sunny Sasha (Jared Finn) and Trotting Grace (Kyle Husted), in the second division and the colt Downstate Classic trotting champion male trotters: Illiniimight (Mike Brink) and Majestic Caprice (Ronnie Gillespie). Headed to Sunday’s second leg of the Carey stake is the Clark Fairley Stable’s Al’s Briefs (Travis Seekman), who sped to a 2:01 flat clocking in the first $8,927 Downstate Classic division 3-year-old colt pace, easily the fastest mile on Tuesday night’s huge 18 race Carrollton program. The first 3-year-old filly pace division saw a dead-heat for first, between Alan Bowen’s Skeeter Machine and the Ryan’s Mistress (Ronnie Gillespie), from the barn of Roshun Trigg. 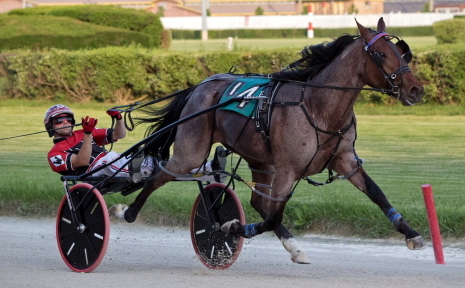 The Jamaica Patton Stable’s Fox Valley Zola, driven by Jamaica, came away with the second filly pave division honors, besting Plum Peachy bound The New Americana (Steve Searle). Gillespie was the driving star on the Carrollton program. The Mississippi native finished with six winning drives and five were from the stable of fellow Mississippian horseman Roshun Trigg. 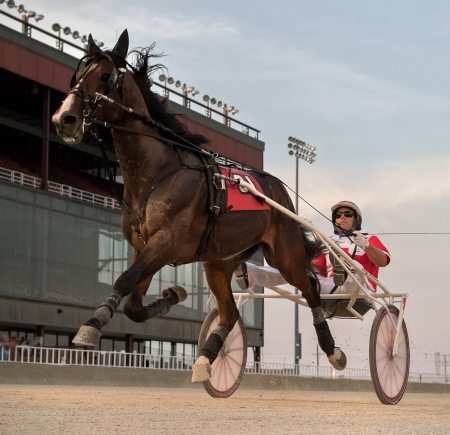 Besides the three Downstate Classic champions, they also teamed up to win with the 2-year-old filly trotter Lou Scion Lou and the 4-year-old mare Lous Credit Report in the IHHA’s aged mare trotting division. The horse and gelding division went to Trixie’s Jethro (Jared Finn), trained by Heather Stell. Gillespie’s other winner at Carrollton, was the 2-year-old colt pacer Ryan Racketeer, trained by Ronnie. The Ryan N Hanover colt made his debut with a 2:03.1 mile, when he drew off by eight lengths. He’s in to go Sunday night at Hawthorne.